I saw these super cute gold state necklaces at Nordstroms last week and of course the first thing that popped into my head was "OMG I can make that with glitter and cardstock!" Alrighty crafty people let's go. 1. Print out your state template here and trace your state onto your 12 pt cardstock. 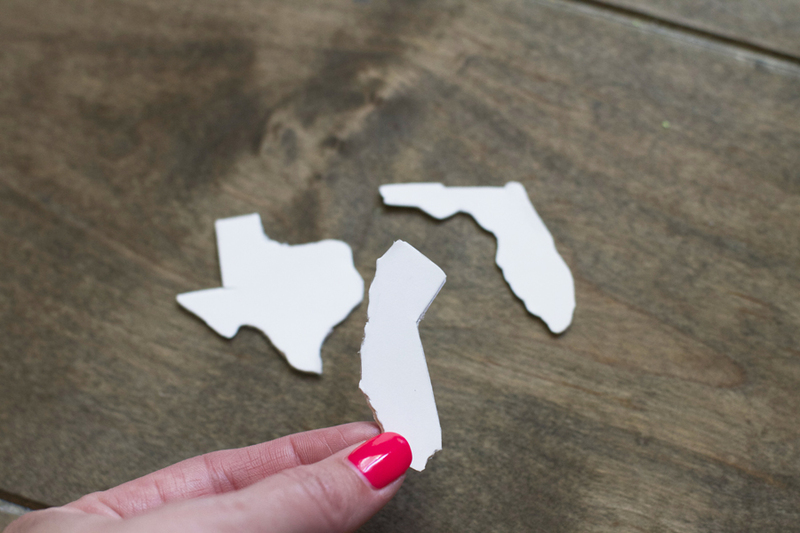 Using scissors or an X-Acto Knife cut out your state. By the way did you know X-Acto knife was spelled that way? Either did I. 2. Now lay your tiny state on a sheet of paper and spray paint it gold on both sides. You will have to let it dry before spraying the other side. Duh. 3. Once your state is dry, apply a thin layer of Mod Podge on one side of the state and cover with gold glitter. Let dry and then coat the other side with a thin layer of Mod Podge and cover with glitter again. 4. Now let everything dry and go back over one side of your glitter with another thin layer of Mod Podge and let dry. Do the same with the other side. The glue will dry clear and your glitter will be sealed in and this way it wont get all over your shirt when you wear it. Duh. Wow, I am so sassy this morning. Too much coffee. 5. Hole punch the top of your state and string through your jewelry chain.